Darwin Animal Doctors Interviewed by Discovery South America! We were lucky enough to be interviewed by Discovery South America! Read about the Galapagos and Darwin Animal Doctors in this Discovery blog by Quino Simaruba. There’s a lot to learn in the article! Looking for a meaningful and exciting job as a veterinarian in one of the planet’s most extraordinary places? Darwin Animal Doctors is looking for a veterinarian to join our groundbreaking clinic in the Galapagos Islands, Ecuador, a UNESCO World Heritage Site. 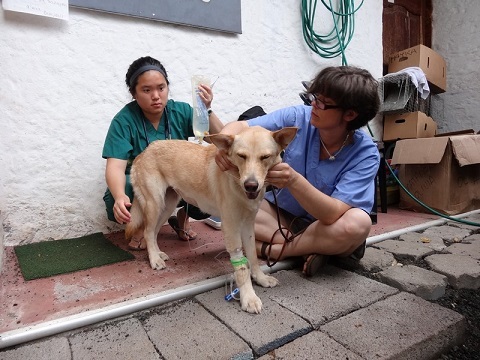 Darwin Animal Doctors, a registered US charity, operates a clinic to provide free veterinary services to protect this special archipelago and help the animals there. As the only full time veterinary provider, there would be no care for the animals otherwise. Darwin Animal Doctors primarily treats domestic animals. Opportunities to treat wildlife are determined by the National Park Service. This is a veterinary experience like no other! The challenges are great, but the rewards of saving lives and the biodiversity of the Galapagos are immense. · Ability to work independently as a veterinarian. Common procedures include spay / neuter and treating trauma victims. Patients are primarily dogs and cats, but may also include horses, farm and occasionally wildlife, but only if requested by the National Park. · Veterinarians with at least one year experience are preferred. This position requires flexibility, creativity and the ability to improvise. We are looking for hearty individuals who can handle living conditions in the developing world and the challenges that come from treating animals on very special islands with limited resources. While you will not always have all the available comforts of home, you will have the opportunity to be creative with medical treatment when standard medication and supplies are unavailable. Our clinic is located in the city of Puerto Ayora on the island of Santa Cruz. Housing is provided at the clinic. For more information, or to apply, contact: volunteer@darwinanimaldoctors.org Applications accepted on a rolling basis. Another Feature of DAD in the Local Media! DAD featured in Fundar Galapagos!